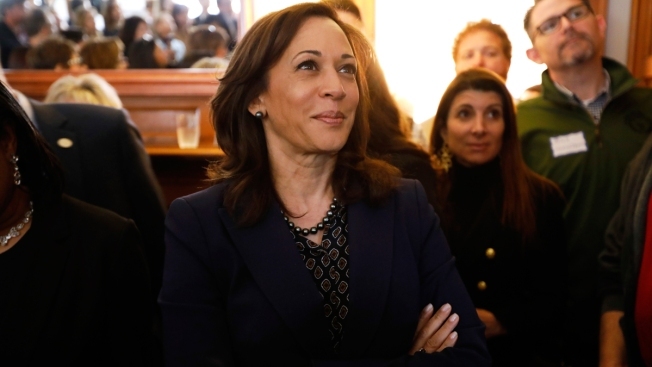 The 2020 White House hopeful says that Americans "are being offered a false choice, which suggests you're either in favor of the Second Amendment or you want to take everyone's guns away"
2020 Democratic presidential candidate Sen. Kamala Harris waits to speak at a house party, Thursday, April 11, 2019, in Des Moines, Iowa. Democratic presidential candidate Kamala Harris says she owns a gun and called it a "false choice" that the only two gun control options are complete, unrestricted access or a desire to seize everyone's guns. The 2020 White House hopeful says that Americans "are being offered a false choice, which suggests you're either in favor of the Second Amendment or you want to take everyone's guns away."